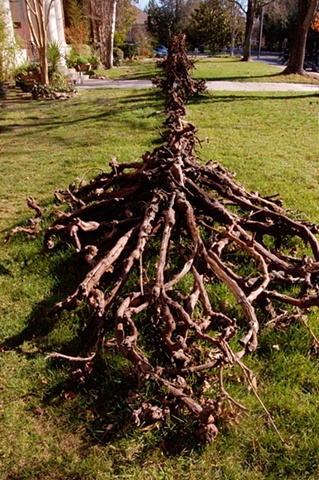 2 ½ acres of 25-year old Chardonnay branches went into the fabrication of the 107-foot long vertebrae-like sculpture. Steel wire, used in supporting the growing branches, acted as the spinal cord fibers. Border bisected the front lawn of the Sonoma Community Center, appearing to emerge from the earth like a serpentine to a height of over 9 feet. At the walkway leading to the building’s main entrance, Border broke in two allowing an open passageway and exposing the severed “cord” on either side.